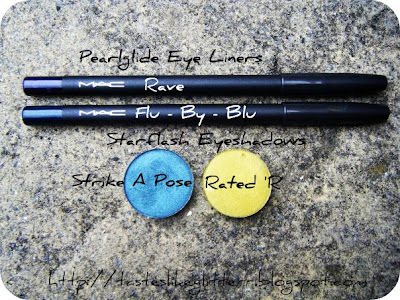 M·A·C Starflash Eye Shadow: A special return appearance of this incredibly intense super pearly, astro-creamy, rich and frosted shadow that makes all eyes a super-nova ... in 12 fabulous limited-life shades! Love That Look? Everybody does! Before these were released I heard a lot of talk about how amazing the Starflash formula was. So, I of course had to try it myself. Everyone was getting Smoke & Diamonds but I knew that if I did, it'd just be a colour I'd hardly ever wear. I like bright eyes so opted for two of the bright colours from this collection. 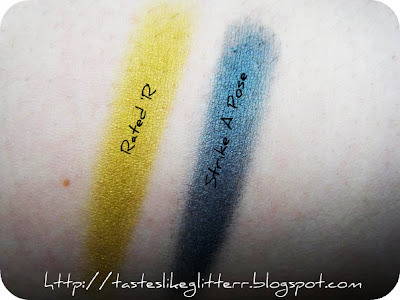 Strike A Pose is a dirty/deep blue green, which looks nothing like the online swatch. It looks closer to being identical to Clarity and it couldn't be further from it. you get some shimmer and they last really well on the lid. 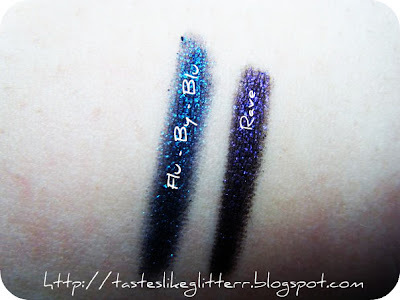 Flu - By - Blu is, according to the site, a light blue with blue glitter. It really isn't that much of a light blue. It's more navy, almost black with bright blue glitter. Rave is a deep purple with purple glitter. These are amazing! I tried them on my water and lower lash line last night and they last for so long! And you don't get that annoying smudgy stuff after a while in the outer corners of your eyes. I know I can't explain it very well but I expect you know what I mean. ;) These are so soft and creamy. I hardly used any pressure to get the coverage in the swatches and they didn't need going over loads of times to look as dark as they should. I really wasn't sure whether I was going to get these but I'm so glad I did. I like all things sparkly, especially these.